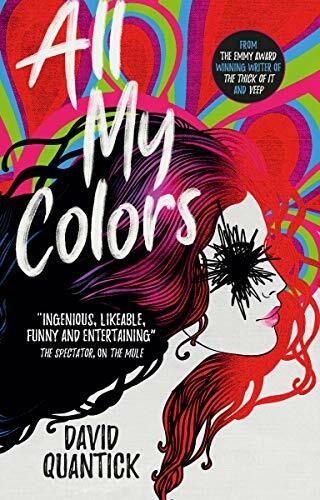 From Emmy-award winning author David Quantick, All My Colors is a darkly comic novel about a man who remembers a book that may not exist, with dire consequences. A bizarre, mind-bending story at the intersection of Richard Bachman, Charlie Kaufman and Franz Kafka. With a looming divorce and mounting financial worries, Todd finally tries to write a novel, with the vague idea of making money from his talent. The only problem is he can’t write. But the book – All My Colors – is there in his head. Todd makes a decision: he will “write” this book that nobody but him can remember. After all, if nobody’s heard of it, how can he get into trouble? As the dire consequences of his actions come home to both Todd and his long-suffering friends, it becomes clear that there is a high – and painful – price to pay for his crime. Starts with a Saturday night meeting of writers, struggling ones, and strange conversing on Norman Mailer and a story of a women and a case of wanting a finger sawn off. Main protagonist Todd Milstead has a Jerk-off room. There will be dark comedy in the narrative and I happen to be in need of a laugh or two. Struggling writer to successfull published first novel, but at what cost and length of the road will this main character Todd partake upon? Absurdities await the to be novelist of something that well you must discover but don’t take it all serious there is dark humour on the road of this authors writing life, one that is succumbed within that great or not so great pursuit of a published novel. David Quantick is a television writer and radio broadcaster with his own critically rated shows One, 52 First Impressions and The Blaggers Guide. He has written TV comedies including Veep (for which he won an Emmy), The Thick of It, The Day Today and more. He is the author of novels Sparks, The Mule, and is the author of two writing manuals, How To Write Everything and How To Be A Writer.